For one year, I took a hiatus from spending money on clothing (shoes, purses, and accessories included). And a lovely lady named Lisa Appelo let me share about the whole experience on her blog. It also got picked up by the Living Well, Spending Less blog for their “Thrifty Thursday” feature. It seems that many of us desire to give thought to what we buy and where we spend our money. When that year ended, I wanted to continue shopping frugally but, more importantly, intentionally. I even have a dream to spend no money on clothing for myself–call it a personal challenge and a way to save money to spend (or give) elsewhere. So, how do I accomplish that? How can I populate my closet with items I actually like to wear but not spend money? These are some of the ways I am blessed to make this plan work for me. 1. Hand-me-downs. Hallelujah for hand-me-downs! Although I am the oldest child in a family of 4 children, I’ve (nonetheless) worn hand-me-downs all my life. Some could reasonably be called hand-me-ups, I suppose, since the givers were sometimes younger than me. In childhood, I wore clothing handed down from the sister of a boy on my brother’s baseball team and from a friend at church, along with stuff from family and from friends of family. On the last day of school in 8th grade, I wore a pair of green scrubs rolled up–REALLY rolled up–and secured with safety pins to simulate a pair of shorts. My aunt had left them behind at my grandparents’ house after completing nursing school; I’d found them years later and claimed them for myself. I almost wore them to our end-of-year school dance, but I actually had the thought, “These are TOO GOOD for the dance; I have to save them for the last day of middle school.” Yep, go ahead and be jealous. 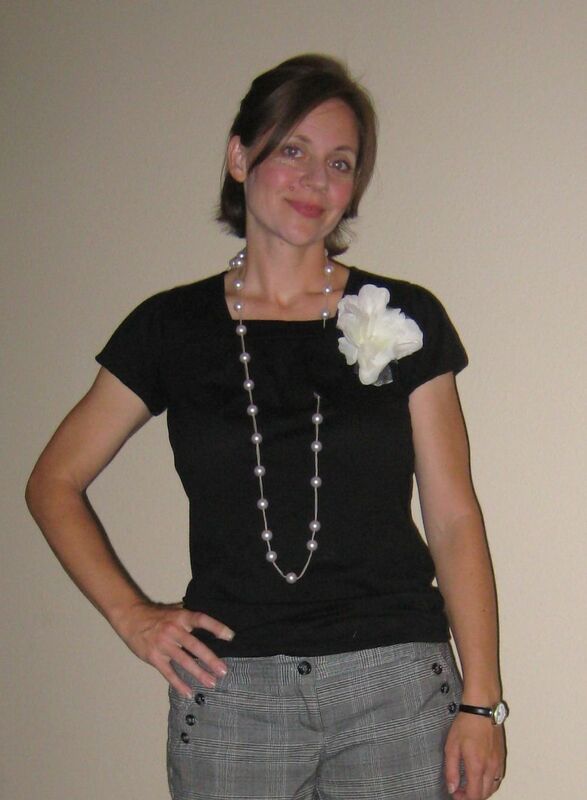 A few years ago…Shirt: hand-me-down from a girl at church. Flower pin: gift from friend. Necklace: gift from sister. Watch: gift from my aunt Janice. When my two younger brothers got older (and bigger), I could wear what they outgrew. When I went to live in Romania after college, I took some sandals that my brother Dave had outgrown. I also brought a sweater and a jacket that some friends of my other brother (Michael) had discarded at our house. Years later, I received a hand-me-down dress from the roommate of a good friend while visiting their apartment. Earlier this year, I got a zip-up fleece vest handed down to a friend, who then gave it to me. A gift from a stranger–what a delight. Lest you think my parents didn’t purchase clothes for us, let me explain–they did. Plus my mama can sew almost anything–and she often did for me. Even so, I always felt these second-hand clothes had a kind of story to them. In every season of life, hand-me-downs have just worked for me. Shirt: hand-me-down from my sis. 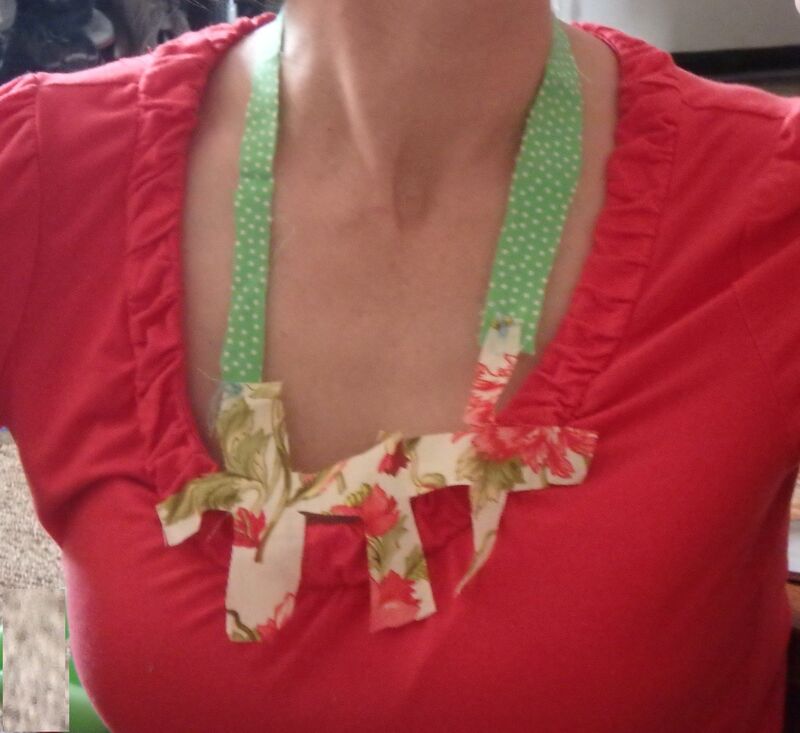 Cloth necklace: made from scraps for me by my older son. 2. Clothing swaps. Big or small, clothing swaps have provided me with a hefty load of second-hand clothes, shoes, even jewelry. The things one can pick up at a swap are akin to hand-me-downs in that they’re second-hand. But at a swap, you get to meet new people–and possibly come home with a treasure from a stranger-turned-new-friend. Last fall, I attended one (for women only); I didn’t have much to contribute, but the hostess urged me to come, anyway. I’m grateful that I did, because I brought home more than enough to make it worthwhile. Also, the ministry (called Cru) with which my husband and I serve hosts something called “the exchange” each year at the national offices where my husband works. This has also been a resource for free goods. It’s still a swap, just on a larger scale. Here’s an idea of how to host a swap of your own in five easy steps. 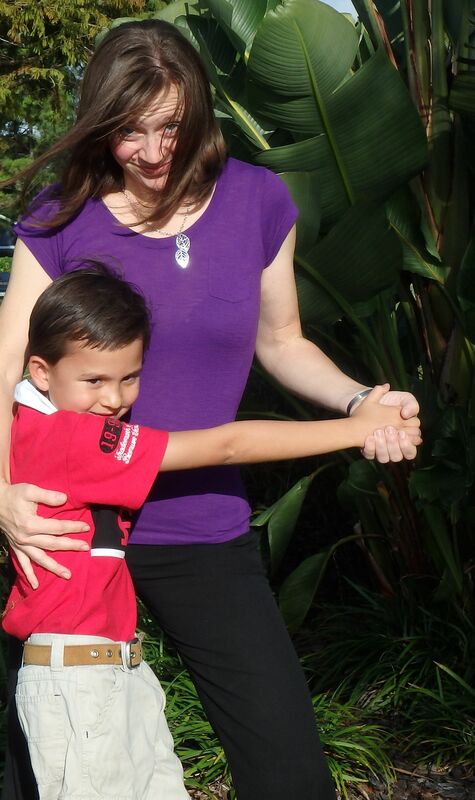 Dancing with my older son, wearing shirt and pants free from the “give away” table at my husband’s office. Necklace: gift from a friend. Pregnant for the 2nd time, wearing a borrowed skirt and a gifted shirt. 4. Gifts. Because I rarely spend money purchasing clothing for myself, I tend to cherish gifts of clothes, shoes, or jewelry that I receive from loved ones. I like the surprise of seeing what somebody else (who knows me well) picked out for me, and I like thinking of that friend or family member when I wear what he or she has gifted to me. 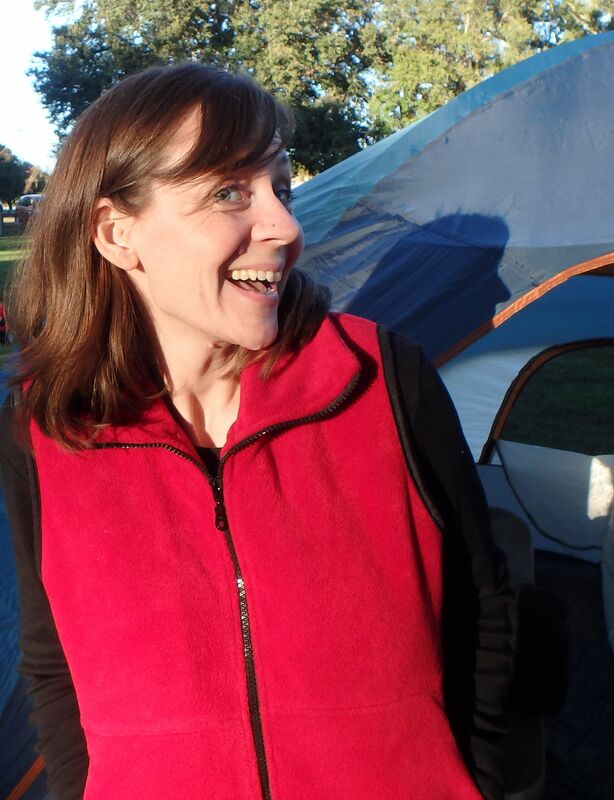 Wearing a black shirt (gift) and a red vest (hand-me-down) on a camping trip in January. You may be thinking, I could never make that work! I need to have a professional wardrobe. Or perhaps, I’m an unusual size; I could never find things to fit me among people I know. That may all be true, but it still might be worth your time to consider organizing a clothing swap with good friends and tasty nibbles. Or even to contemplate your own rest from spending on self–whether for one year or some other amount of time. Taking a moment to approach your clothing choices thoughtfully is a moment well-spent. Or not spent, as the case may be. Gotta tell you Allison, you look truly amazing all the time. This challenge is really working for you.